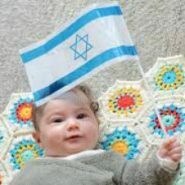 Home » Current Events » What Happened to the Baby Born the Same Day as Israel? 70 years ago today, the joy of Jews around the world knew no bounds when Ben Gurion declared the establishment of the State of Israel. Afterwards, Ben Gurion and the gathered crowd sang HaTikva and the Shehechiyanu prayer was recited. But Ben Gurion wasn’t aware that that very day, just a few miles away away, 2 equally overjoyed Jews recited Shehechiyanu–over the birth of their newborn daughter whom they named Tsiona. I heard about Tsiona from my neighbor, her niece, who attends Tsiona’s annual birthday party every year on the eve of Israel’s Independence Day. This Independence Day, I’ve been thinking a lot about Tsiona, and what she’s lived through these 70 years. She remembers her own parents, survivors of Buchenwald and the Lodz Ghetto. Who lost their entire families in the Shoah. Married in a DP camp. Came together to Israel, and merited to become the parents of 2 sabras, Tsiona and her younger sister. She remembers her husband, also the child of survivors. She remembers their own 4 children. Their 11 great-grandchildren, so far. Each and every one of them, born within the reborn State of Israel. Breathing in, every day of their lives, the holiness, the sense of mission, the determination (some might call it chutzpah) of Jews returned, by revealed Divine Providence, to their eternal homeland.